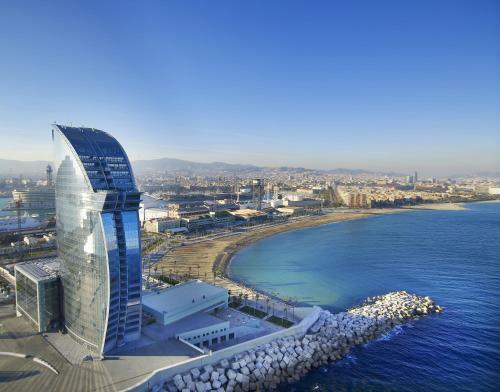 W Barcelona is a striking sail-like structure next to Barceloneta Beach, offering breathtaking design and fantastic views over Barcelona. It features a spa, infinity pool, rooftop bar and luxurious rooms. The W Hotel?s impressive rooms feature avant-garde design and views of the Mediterranean or the city. They all come with a chaise longue, flat-screen TV, iPod docking station and rainfall shower. The W has two stylish gourmet restaurants, as well as a poolside bar and a lobby bar. At ECLIPSE bar, located on the 26th floor, you can enjoy a cocktail with panoramic views over the city and sea. Facilities at the Bliss Spa include a jacuzzi, sauna and steam room, and a wide range of relaxation and beauty treatments is available. The W is 20 minutes? walk from Barceloneta Metro Station, and buses stop outside the hotel. - Guests must be 18 years or older to reserve a room. - The hotel does not accept personal cheques. - Extra bedding is available for specific room categories only. Fees apply. Access to the Eclipse rooftop lounge: - children under 11 are not permitted in the Eclipse rooftop lounge - children from 12 to 17 are permitted until 21:00 and must be accompanied by an adult. Access to the WET Deck: - children under 16 are permitted in the pool until 18:00. They must be accompanied by an adult at all times when on the WET Deck.